Dike the Goddess of Mortal Justice and Dawn, Maternity Session. One thing I quickly learned when I had my children was that I would be up at the crack of dawn for a very long time…if I ever actually got the chance to sleep at all! My three year old still wakes at dawn. The joys of motherhood! It only felt apt to portray some form of this with a maternity photoshoot shot at dawn, based on the Greek Goddess who brought in dawn. Lets face it, who better could I have chosen as visual representation of dawn than a woman who is just about to embark on her own adventure of dawn with a newborn baby. Also, lets face it, any woman who grows a child in her body is a miracle really, and therefore shall be given Goddess status-by me atleast! So we ventured off at 5am in the hunt of a field that I had shot this photo at in June. We didn’t find the exact field, because if you’ve ever been to Lymm in Altrincham, you will realise that fields are everywhere, along with windy roads and we ended up getting lost…or maybe we found the field but it had been cut down…anyway, it looked great and sunrise was gearing up to peek its head out so we got started on shooting. It was cold, my assistant dropped out last minute, so Kara had to throw her own fabric- not as fun as it sounds when you’re 36 weeks pregnant! Anyway, we powered on, and got some great results! After the outdoors session, we went back to the home studio to complete some further images which we were unable to produce in the cold-like lying down shots and flowing hair. I started off with the original image of the model, and resized the frame to roughly where I wanted her to be in the frame. I then added the background taken on a glass bottom submarine in Crete. I removed the backgrounds from both the model and the fish and changed the fishes colour to purple to see if that would blend nicely with the pink…it didn’t look too great! I selected the tail of a fish that I had photographed and placed it roughly on the models body where I wanted it to fit to create the mermaid tail. I had a go at liquifying the tail, however I wasn’t too happy with the result, I changed the colour of the models outfit to blend to the tail more. I added in a back light to highlight the model using the screen tool and a light blue. I started to add in several more layers of the fishes tail…this is when the iMac started to get really slow-but I couldn’t flatten the image as I knew that there was a lot more work to be done behind and in front of the subject to blend her into the scene. After adding in plenty of fish tails and blending them together with liquify, puppet warp and free transform, I experimented with changing the colours of the tail to match the halo of fins behind the models back. At this point, I realised that part of the models arm was missing, so I cut it out and merged it back in. I then selected a shot of my models hair where it was more flowing. In hindsight I would have photographed this either in the water or on a black background to make it easier. I roughly placed the hair where I wanted to mask it in. I then changed the grading of the image using several curves, levels and a black and white semi opaque layer. I then made a trident using a stock image as a template for the shape, then drew it using shading and a texture and set it to place using the free transform tool. I composited in a turtle and some fish, of which I photographed in a similar area to the background in Crete. I created a bubble brush preset by doing the above with a mixture of hard and soft brushes and the elliptical tool. To develop my work, I am writing and sharing Gibbs Reflective Cycles of my studies in photography. 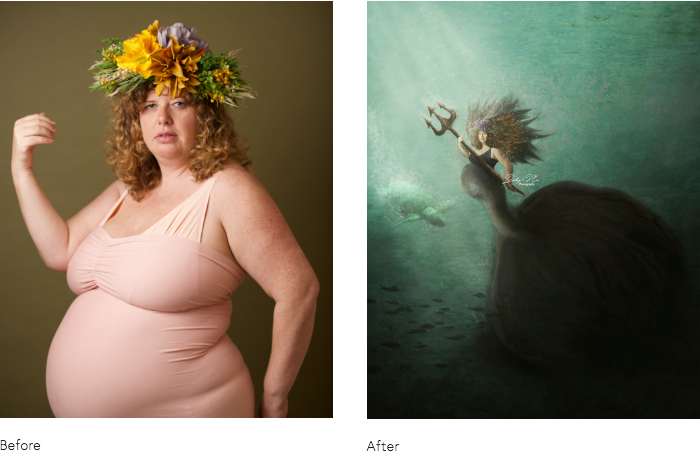 Below is a Gibbs reflective cycle of my experience photographing a themed maternity session based on the Greek Goddess Amphitrite: the Goddess of the Sea. I wanted to produce a photo that represented the Greek Goddess Amphitrite, goddess of the sea when pregnant, as part of my creative maternity series as part of my Guild of Photographers panel of 21 images. 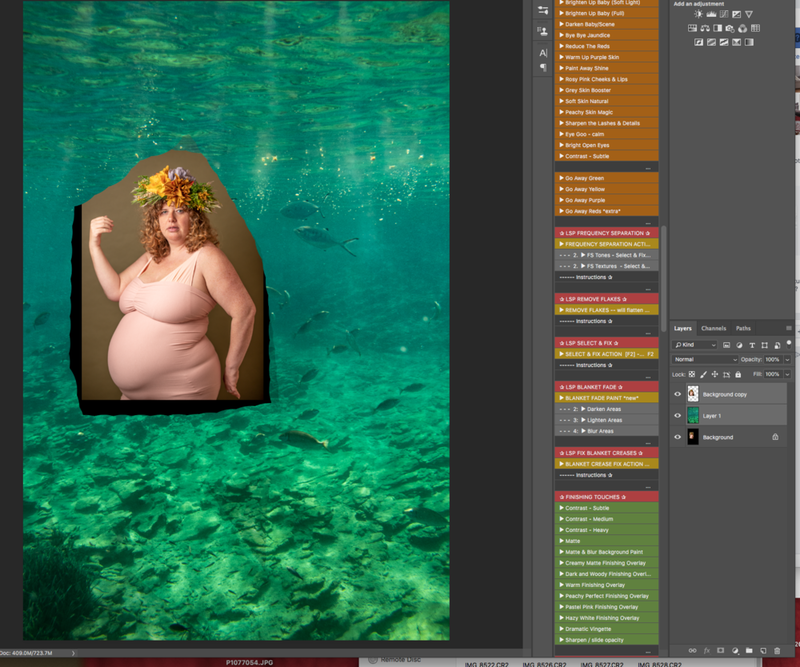 I decided that I would use a larger model for this session as I wanted to turn her into a mermaid in edit. The model I chose was 38 weeks pregnant and plus sized. She was quite difficult to pose as she hadn't done any modelling before and was very uncomfortable, being so heavily pregnant. I showed the model examples of what I was trying to achieve, and explained about hand positioning, in line with the guild of photographers hand posing rules-no backs of hands to be seen, and no palm of hands, preferably with the little fingers closest to the camera to make the hands appear smaller. This seemed to confuse the model, but we did end up getting a shot that worked. I also didn't have a trident, so I drew one in photoshop, then added a texture to it to make it look old, and shaded it to match the lighting using white and black at low opacities on a 50% grey layer. I made a bubble brush in photoshop, and set it to multiple random arrangements so it looks more realistic to add to the scenery. There are several dodge and burn layers used on a 50% grey layer on soft light. There is a created light stream from a warm light colour painted on using screen. The subjects were cut out using masking, and I further blended the edges using a Deardorff smoothing brush with the smudge tool at 25% opacity. There are several blue-green layers painted to highlight behind and in front of the mermaid. There is a layer of a photo rough waters taken in Crete, placed behind the turtle and mermaid to add in the texture of moving water. Skin smoothing and makeup on the model was done using a portrait pro plugin. The models body shape has been altered using the liquify tool, to pull in her back and pull out her bump and alter the texture and appearance of her hair. Grading was done to the image using low opacity levels, colour gradients and a mid opacity black and white layer. There is a final texture layer of a marble floor added at low opacity on a screen layer to nod to a painterly fine art effect. Even though I am happy with the final image, I found it very stressful to edit such a large file size- as my computer kept crashing and being very slow. The image in total took around 40 hours to create. This is much longer than I anticipated for one image, which has really stressed me out thinking that I have 21 of these to produce! I produced a piece of work I am really happy with. The shoot went as planned, even though the model was not experienced I felt I got what I needed to have a base image to work with. I worked well around lack of props by using my artistic skills to draw one so it looked realistic enough to pass as being there. The image as a whole looks as it should do, and most people would not be able to tell that It is actually several composites. The image is a good talking point and opportunity to sell some of my normal work, and meets criteria to enter into competitions, hopefully raising my profile. I enjoyed creating the work and seeing my vision come together. It took far too long to realistically produce for clients-unless they are paying for a week of my time. Realistically, an image like this would cost a minimum of £400 to produce just one, which would only just cover my time working on it! The RAM on my iMac struggled to keep up with the massive task at hand, and I was very worried that it could possibly destroy my computer. I could have shot things with more organisation and planning, to make sure it didn’t give me as much work to do in the editing room- such as the hair. I may have to face the reality that creating 21 images for the deadline is too big of a task to complete, however I would be happier spending more time on this project to ensure that the images are correct to submit for a craftsman panel instead of qualification panel as this was suggested by my mentor at the Guild of Photographers. Review the images left to edit and organise an estimate of how long they will take to produce. Look into getting the RAM upgraded on the iMac to see if it speeds up the process of editing. Draw up a plan to organise the final photographs to submit as a panel-whether complete or otherwise continue through the final major project. To develop my work, I am writing and sharing Gibbs Reflective Cycles of my studies in photography. 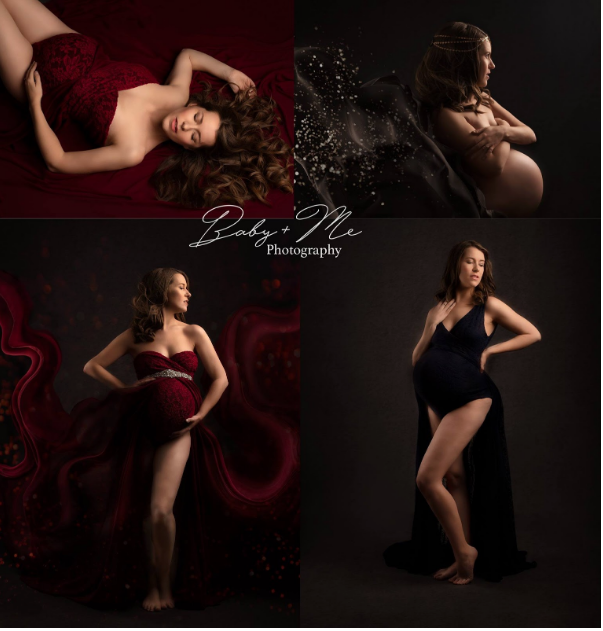 Below is a Gibbs reflective cycle of my experience photographing a themed maternity session based on the Greek Goddesses Gaia, Aphrodite and Rhea. I photographed three sessions on the same day using the university studio. I sourced two models: one professional model who took on two roles (Gaia and Aphrodite) and an expectant mother and child (Rhea). Upon setting up I quickly realised there was an issue with the lighting rig- with the lights being too heavy to stay up where required to attain the correct angle of lighting. As a quick fix, I had to tie the light stand up with shoe laces so it stopped dropping. Upon setting up for the session I also notice that the shutter was visible in shots taken over 1/100. I usually shoot between 1/125-1/200 so was quite disappointed that I would have to reduce the sharpness of my images by using these lights. I worked with a makeup artist for the looks of the models-he did well with the makeup applications however I did struggle with him taking over the shoot and being distracting. The models were easy to pose and even the lady with her 2 year old daughter performed well. The shoot ran over and I had to leave before overseeing that the makeup artist had cleaned up. I was very disappointed with the lighting in the studio, so much so that I decided I would not be using it again. The condition I found the studio in was not of a professional standard, which made shooting conditions difficult to manage. I did not have a studio induction which was requested before the shoot so I felt a bit disappointed with this. I felt that the makeup artist tried to take over the session quite a bit as he was filming for his showreel and dragged the shoot on for a lot longer than we had originally planned. He had also made a bit of a mess and not tidied up which was then reported back to me by tutors after the session. I felt that although I got the shots that I needed to a degree, they would have turned out much better if they were shot in my home studio. The university studio was unfit for use. I would have benefitted from a stricter schedule, if I knew the makeup artist would be so difficult to accommodate. My choice of models, outfits and props worked well. The photoshoots were successful even though several issues could have derailed them. In future I will use my own studio space and hire a professional makeup artist under stricter conditions. I will write up photo shoot schedules for sessions that have several models. I decided that I wanted to document the process of creating a panel of images, which blends in with my study of Photography and my ongoing relationship with the Guild of Photographers. I would like to produce a panel to submit for qualification at the Guild of Photographers, please see footnote for requirements. Produce 7 Maternity Portrait sessions, 3 images from each. Theme: The greek goddesses of motherhood, childbirth, nature and love. Locations: Images will be taken in varied settings: a mixture of outdoors, at sun rise , in the university studio, and at my home studio. All studio sessions will be taken using a green screen to composite from to chosen backgrounds. These images are approximately 18 months old. so my style and technical knowledge have grown somewhat since these images were taken. I would like to blend these styles with my usual editing style for portraits and create something quite fine art yet still commercial to add to my business. I would like to layer imagery to create fine art backgrounds in some of the images, especially one image, of which I would like to create with all of the women in a Renaissance style piece of art work. I would like to present these images as a digital panel, and also print the multi model Renaissance style piece in a large golden frame on German Etching Fine Art Paper, intended as an aid to sell products at IPS gallery viewings. The final pieces will also be printed into a book, as volume 1 of my maternity work to showcase to potential clients. I will be updating my website with a maternity section, aimed to sell the sessions alongside my newborn packages and as a standalone product. As a bonus, the same mothers will be coming back in January for their Newborn Photoshoot sessions, so I will be looking to submit these to the Guild of Photographers as a Newborn Qualification Panel. Rhea-Earth, Fertility of the Soil, Motherhood, Daughter of Gaia, Mother and baby, fine art studio, creams, muted greens, flowing fabric, breastfeeding? Amphitrite: Queen of the Sea, Mother of Triton, Poseidon’s wife. Metus: Wisdom, Prudence, Zeus Swallowed whole while pregnant and gave birth to their child through his neck. In a womb, skin coloured latex, ethereal, haunting. I would like to add a maternity photoshoot section to my business and work on developing my maternity styled shoots after training with Natasha Ince, one of the UK’s leading maternity photographers. . I have specific images in my head that I feel that I need to get out. I have visited both Kefalonia and Crete in the last 2 years, and I am very inspired by the greek gods and goddesses meanings and styles having grown up studying Classical Studies throughout high school. I believe that having a strong cohesive theme to my panel will ensure that the pieces work together in a congruence of harmony and could create a buzz around the work on social media. I am collaborating with makeup artist Harley Strider on the Makeup Degree for several of the sessions. He specialises in show stopping makeup which will take my work to the next level. I have already shot one session, Dike- at dawn (see above). The planning, execution and post production will be included in my file. 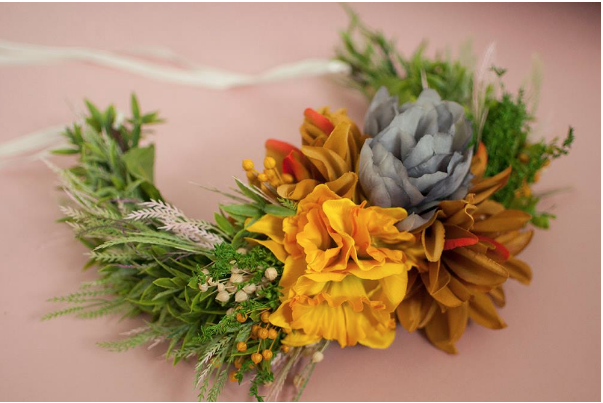 I have commissioned a boutique halo maker Anna Croliq from Flora House to make three Flower crown halos to be used for Gaia, Aphrodite and Hecate. Gaia: I wanted her headpiece to be incredibly opulent, vibrant and quite over the top, whilst still remaining earthy- The aim for this halo was to be able to add to it in photoshop with layers and textures, while the headband can also be repurposed. Aphrodite: I wanted her headpiece to be quite airy, neutral and elegant with a hint of luxury. Aphrodite will be in creams and pinks, so the halo had to match the ethereal purposeful styling. Hecate: I wanted Hecate’s headpiece to be dark, vibrant and luxurious. Pinks and purples mixed with deep greens will all stand out in dark imagery without looking out of place.